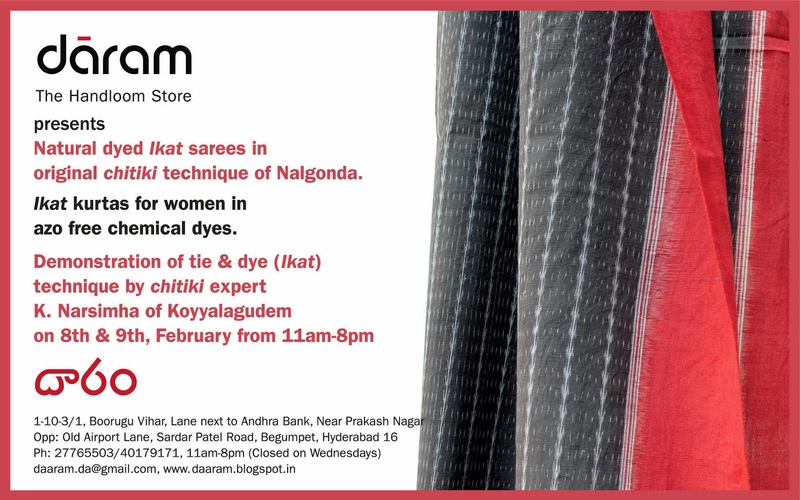 dāram, Hyderabad’s exclusive Cotton Handloom Garment Store, presents sarees in chitiki tie & dye technique of Nalgonda, woven by K. Narasimha, chitiki expert of Koyyalagudem, Nalgonda. K. Narasimha is 78 years old and has been practicing chitiki technique for the last 55 years. He started weaving when he was 16 years old and learnt tie & dye technique at the age of 20 years. He started his chitiki practice by weaving telia rumal thaans forty years ago. He worked for the handloom co-operative in Koyyalagudem and wove ikat sarees, dupattas and shirting in both single and double ikat techniques. He is a very skilled artisan who continues to produce fine ikat in natural dyes along with his wife K. Manemma. He also worked as a tie & dye trainer for 20 years for Weavers Service Centre, Hyderabad. He has trained over 300 weavers across 12 co-operatives in Andhra Pradesh and Tamil Nadu during these trainings. 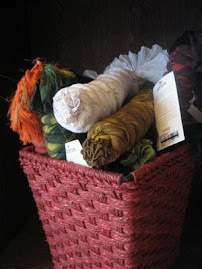 Also available are telia rumals which are traditionally made in maroon, white and black using natural dyes. This practice has disappeared slowly and today, K. Narsimha is the last of the practicing experts. 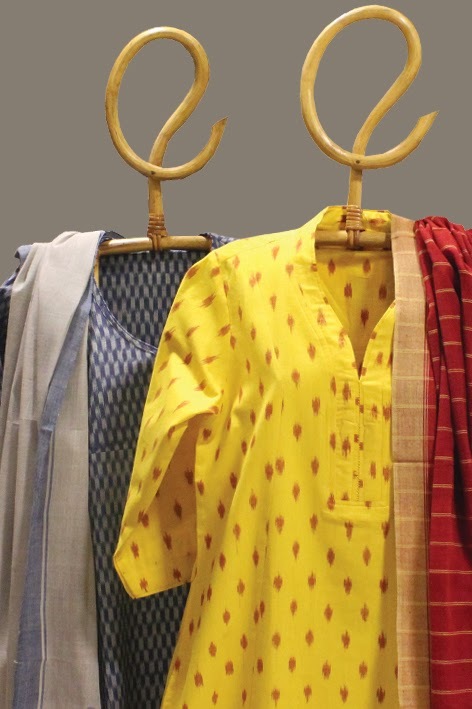 Along with a limited collection of natural dyed ikat sarees dāram will also launch a range of ikat kurtas for women in vibrant azo free chemical dyes. Natural dyed ikat sarees are designed and produced on the lines of traditional chitiki of Nalgonda. 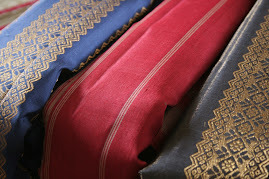 The sarees are woven with yarn dyed in blue, black and red using natural dyes. 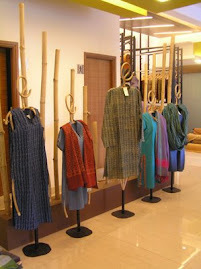 Ikat range of kurtas for women come in a range of colours and this range also reflects the traditional chitiki of Nalgonda. After two successful years of Gongadi exhibitions in Hyderabad, Chennai, Delhi and Bangalore, the Deccani Gorrela Mekala Pempakadarla Sangham and the Unni vedika, embark on the third season of exhibition in Hyderabad organised by dāram and Anthra. This exhibition showcases the innovation of Narayankhed weavers, Medak - the 2*4 prayer/yoga mat Gongadi along with the traditional 8*4 Gongadis. The Gongadi narrates the stories of a tradition in the length of a yarn. An intricate weave of Telangana, the Gongadi is a woollen blanket handspun by women and subsequently hand woven by men. 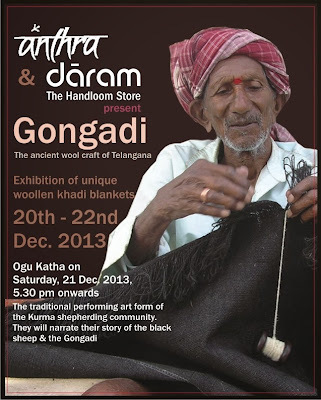 Black is the dominant color of the Gongadi, woven from wool obtained from the Deccani breed of sheep locally called nallagorre. The Gongadi was widely used by the village community and continues to be an integral part of the Kuruma traditional sheep rearing communities’ culture, and a popular symbol of Telangana. The breed was rapidly diluted, via government policies begun in the mid-nineties, to introduce the heavier and fatter growing hairy non-wool Nellore breed of sheep, originating from coastal Andhra, into Deccani flocks. Such policies resulted in a ‘mixed bred’’ sheep that had more hair than wool that could no longer be spun into yarn. Unprecedented rain in 2013, resulted in large mortality of the Nellore and Nellore cross breeds in Telangana, whilst the Deccani sheeps withstood dramatic climatic changes, exhibiting low mortality and high resilience. The revival of the Gongadi, reflects the commitment of the Deccani Shepherds Sangham of Medak to sustain the Deccani Breed, which has been diluted in other parts of the State. The Sangham demonstrates its leadership to conserve the breed and craft: from defending their rights to graze, protecting forests, community grazing resources and water bodies, promoting animal health and sustainable agriculture, to rediscovering the knowledge of the Deccani and reviving the wool and the Gongadi woolcraft. From 40 women spinners 12 weavers, and 3 Kada makers in 2011, today in 2013 nearly 100 women spin wool, 35 weavers and 13 Kada makers, are anchoring the production of the Gongadi, through the Unni vedika. The exciting news is that today sons and daughters are returning to the craft. 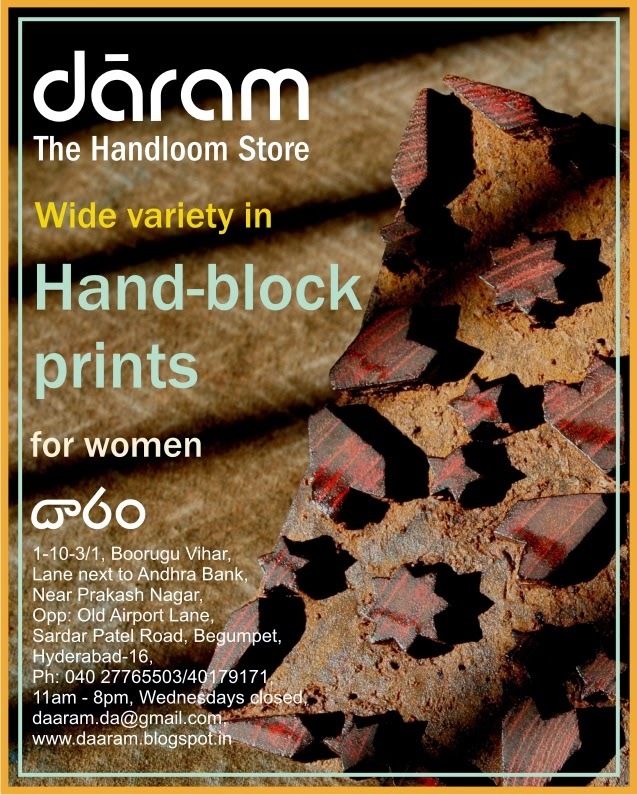 We invite one and all to support the craftspeople, the Gongadi, and the Deccani sheep which are entwined with one another- much like the Gongadi’s warp and weft, that will lead to sustainable and resilient livelihoods for the women and men of Telangana. 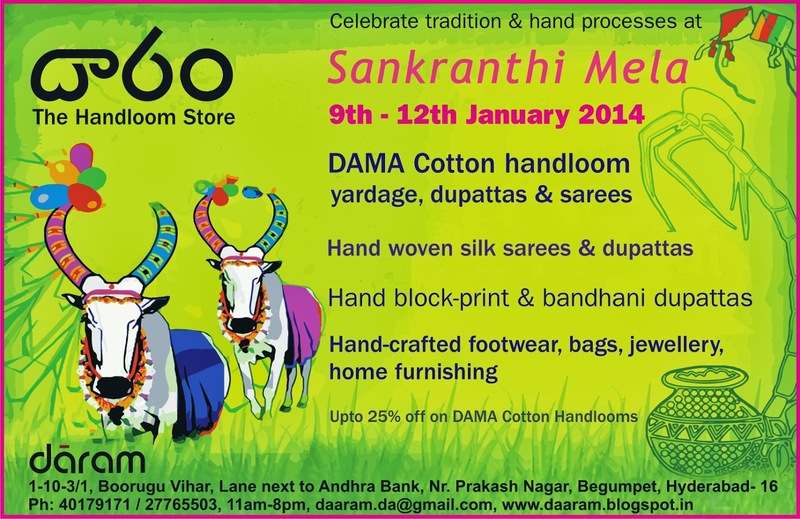 We cordially invite you to the Exhibition and Sale at dāram, from 20th – 22nd December 2013. 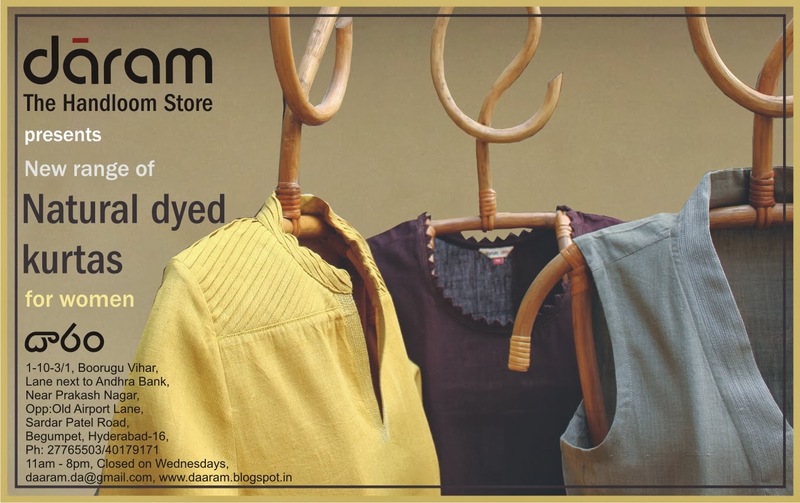 If you would like to be updated about events at dāram, please write to daaram.da@gmail.com. Your information would not be shared with anyone, and you can unsubscribe any time. dāram is the only store in Hyderabad dedicated exclusively to garments made from handloom fabric. 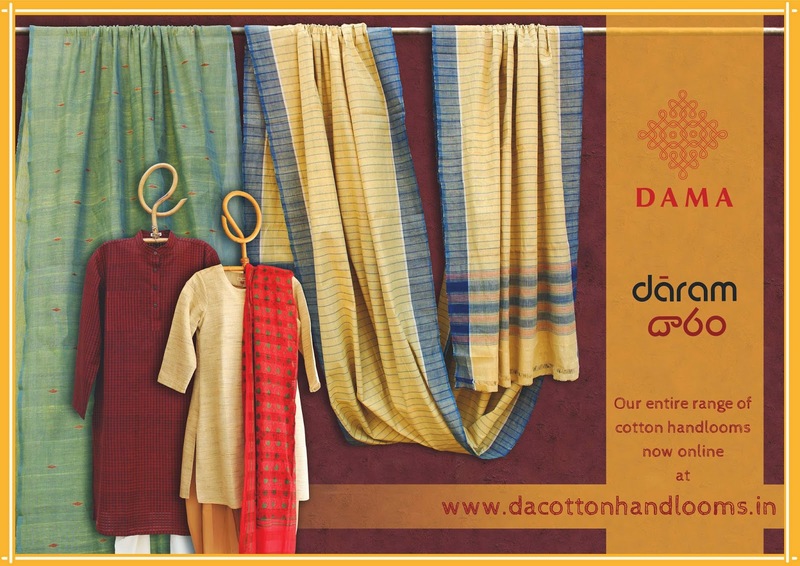 An initiative of Dastkar Andhra (DA), the Dastkar Andhra Marketing Association (DAMA) and partner co-operatives, it is an effort to promote the handloom process and at the same time make good quality garments available to the customer at a reasonable price. 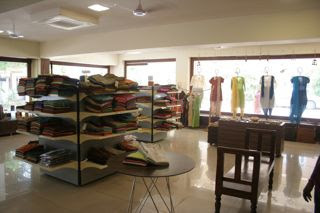 - Exchange on garments and sarees only. - Exchange within 10 days from date of purchase. - No exchange without invoice/bill. 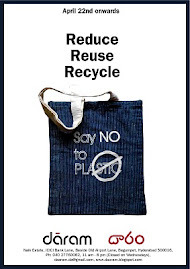 - Tags should be intact, product should be unused & in saleable condition. - Sarees can only be exchanged with another saree. - No Exchange on non-textiles and exhibition products. 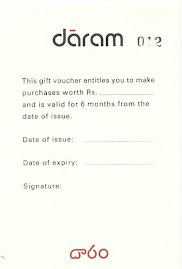 - An exchanged bill is not valid for another exchange.